Lime Blossom Naturals is a lifestyle boutique dedicated to “green living, one baby at a time”. London’s parents received some terrific help from owner Misty Vento and her store to create year round Cherry Blossoms in the nursery. Whatever looks good…I like to mix and match styles but I don’t like “packaged” looks or straight out of a magazine designs. I prefer originality and quality. A lot of help from Misty Vento with Lime Blossom Naturals. Tavern Taupe by Sherwin Williams on the walls. Custom Wainscoating and custom valance made from the same material as the Garden Blossom Crib Set by Dwell Studio. Too many to choose really but I love the mural that Misty did and the furniture. I think it all ties in very well so the room as a whole is even better than the parts. This is lovely and London will love it too! 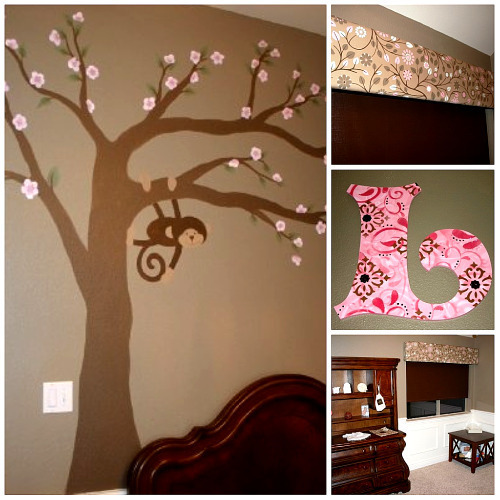 Where can I order the fabric used for the valance in you adorable nursery? The valance was hand made by Misty Vento who designed the room and mural and the homeowner. The fabric used was actually a fabric shower curtain by Dwell Studios ordered through Lime Blossom Naturals website.